My new best imaginary friend, Kenji Lopez-Alt, has completed a four-week experiment to determine what truth the “McDonald’s Burgers Don’t Rot” meme has behind it. Most serious speculators assumed that the burgers and buns dried out in the air-conditioned interior of an average home. Surprise, surprise – that’s exactly what Kenji discovered. There’s nothing magical about it, just small burgers in a dry environment. Science! This entry was posted in Food, Geek, Science on 2010.11.05 by Gary. This entry was posted in Education, Science, Stupid People and tagged health, homeopathy, quack on 2010.02.23 by Gary. Remember that adapid fossil from back in May? Turns out, all that breathless excitement over this “missing link” was premature and erroneous. Of course, most scientists would have told you the same thing in May, since the research was published on the Discovery Channel before it was peer-reviewed, the adapid line is actually not considered an ancestral family from humans, and a few other reasons too no doubt. This is exactly why I dislike the automatic “missing link” verbiage that gets attached to any story about any prehistoric primate or ape. First of all, it’s ridiculously misleading to think of evolution as a series of links in some sort of chain. And, secondly, when your missing link turns out to have been on a different tree branch, the less-informed just use it as another bludgeon to hit the “ain’t no monkeys in my family tree” drum. Darwinius Masillae remains an interesting fossil and a remarkably well-preserved 45 million-year old find, but it’s not a human ancestor. Take that, premature publication! On the other hand, this is a great example of why science needs to be better respected in this country. Unlike any other method of dealing with the world throughout history, science is willing (sometimes eager) to admit mistakes, and is always self-correcting. Every scientist wants to make a name for him or herself; proving your peers are wrong in a big way is a great way to do that. That it also advances human knowledge is a great thing for those of us not in the research world. Where would any of us be if previous generations had decided that any evidence contrary to “electricity is magic” was heretical and would be ignored? I’m rather glad to have this here electronic typewritery thingy. This entry was posted in Education, Geek, Science on 2009.10.21 by Gary. This entry was posted in News, Science on 2009.10.08 by Gary. I hate the breathless and somewhat hyperbole-laden reporting of every new fossil find. This month, it’s Ardipithecus Ramidus, which the press is calling the “oldest pre-human” fossil. Um, wouldn’t the oldest pre-human fossil be the oldest fossil? This obsession with a “missing link” between humanity and the rest of the animal kingdom is a bit tiresome. There are jillions of links, and there are undoubtedly going to be jillions more found in the future. Every time someone finds something from the primate branch, the media goes into a veritable frenzy. Of course, we find anything which casts any light on our own branch of the tree much more interesting than the spectacular specimens of pre-whale fossils back in February. But to claim that this Ardipithecus shows that we didn’t evolve from chimps is ridiculous. Nobody claims we did. Some biologists and anthropologists may use the shorthand of saying we evolved from something that looked something like a modern chimp, but nobody ever said that we evolved and chimps stopped. Evolution doesn’t work that way. Everything is just as “highly evolved” as everything else. Each species occupies a niche for which it has become adapted over eons. That doesn’t in any way mean that humans are the most evolved form of life – we’re just the only ones who write about it. Oh, and scientists have been writing about Ardipithecus since at least 1999, and even pointed out that it was a hominid but not a common ancestor with modern chimps back in 2001. This entry was posted in Education, Geek, News, Science on 2009.10.01 by Gary. On August 25th, four hundred years ago, Galileo Galilei showed his telescopes to the Venetian lawmakers. With the Galileoscope the Boy and I assembled this weekend, we observed the four satellites of Jupiter that are called today the Galilean moons: Ganymede, Io, Europa and Callisto. Then the clouds covered them up again. Although a bit later in the year than I’d hoped we have received our two Galileoscopes (no, I don’t know why I bought two of them, other than they were cheap so why not? ), and they’re very spiffy. We’re using the basic 25x magnification right now, although we may put together the 50x eyepiece to peer at Jupiter more closely tomorrow. We should be able to see the Great Red Spot about 10:30pm this week. Not sure about how that will go. The Boy can’t seem to avoid bumping the scope, making massive changes in view far too common. The Woman, of course, was much better and caused no problems when she looked at Jupiter and its four moons. Very cool night. Somehow, the Boy convinced me to get up at 6am on a non-work day, so we could peer at Venus and Mars. I’ll let you know how that goes. This entry was posted in Education, Geek, Science on 2009.09.05 by Gary. Although my Galileoscopes (ordered in February) stubbornly refuse to arrive, I’m still digging the International Year of Astronomy 2009. Here’s a really amazing set of images – artistic, not photographic – of the planets. Consider it a graphic version of the Holst piece. 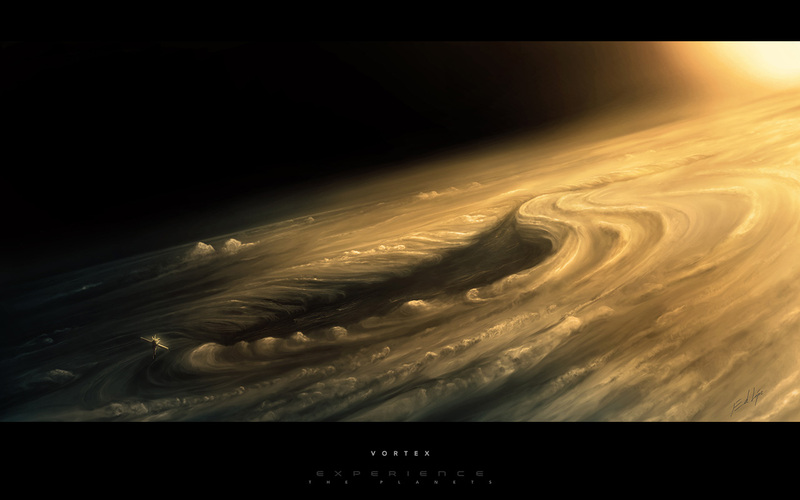 This is an artist’s concept of a cyclonic vortex on Venus. Much higher resolution available at the site. This entry was posted in Geek, Science and tagged IYA on 2009.09.01 by Gary. This entry was posted in Geek, News, Science on 2009.08.18 by Gary. To prevent anyone from thinking that I focus only on things to be pissed off about, here’s a piece of good news from the journal Science. Some fisheries are beginning to recover from overfishing, due to more stringent regulation from governments and more public interest in fishing practices. I’ve been a big proponent of sustainable fishing for as long as I’ve known the term (thanks, MBARI), so it’s nice to see that there’s some good news out there. Of course, there’s a bit of bad news as well – Europe, for all its vaunted “better than America” rhetoric, is demonstrably worse in managing their fisheries. We’ve had Alaska as an example for decades, with their seemingly neurotic obsession with sustainability, and we’ve been expanding that down the coast now. It looks like Europeans aren’t learning from the mistakes of the past, and they’re gonna kill off the bluefin tuna population if they aren’t careful. Check out the map with the NPR article – all of the North American fisheries are either healthy or recovering; none are declining. We’ve got something to be proud of there. Regulations can be good. This entry was posted in Food, News, Science on 2009.07.31 by Gary. This has been a great year for fossils (ironic, as it’s the International Year of Astronomy, not paleontology). Now we have a new adapid, Darwinius Masillae. Perversely, the fossil was uncovered over 25 years ago, but was kept away from paleontologists and biologists until 2007. What a delay! This entry was posted in Geek, Science on 2009.05.20 by Gary. This entry was posted in News, Science on 2009.02.04 by Gary. Check out the Galileoscope – it’s an attempt by the International Year of Astronomy to create a $10 telescope that can resolve the rings of Saturn. This entry was posted in asides, Education, Geek, Science and tagged IYA on 2009.01.30 by Gary. Since there was great hue and cry recently over the completely unprecedented level* of cold that great parts of the United States have experienced this year, it’s reasonable to assume the same people are following this week’s weather news as well. This entry was posted in News, Science and tagged climate change, denialists, global warming on 2008.12.29 by Gary. When I was 8 years old, I had two chemistry sets. I went through all sorts of experiments, producing acids that I used to clean/destroy small objects, color-changing things, etc. I’ve seen several times over the past few years stories about the new chemistry sets, which apparently don’t contain any chemicals more interesting than tannic acid (tea extract). We don’t want our young people to grow up curious about science, obviously. And then there is the curious case of Lewis Casey, who was arrested on suspicion of making meth in his garage. When it was proven rather easily that his chemistry lab was merely a chemistry lab (he’s a college chemistry major), the Canadian government charged him with making bombs instead. Have you ever heard the term “chilling effect” before? Casey is no longer allowed to engage in chemistry experiments except under supervision in school labs. This entry was posted in Civil Liberties, Geek, Science and tagged chemistry on 2008.12.29 by Gary.